Using Older Hardware with VMware ESX; Make Sure It Is Compatible! Part of planning a VMware deployment is deciding the hardware that it will go on. A common solution to reduce costs is to use existing infrastructure of older machines and just place VM’s on this platform. While this will work there needs to be some considerations when deploying on existing hardware. The very first thing to always do is check the Hardware Compatibility List (HCL). This is the supported list from VMware with “guaranteed” approved hardware. Also, 64Bit seems to be a reoccurring topic. There are strict limitations what will and won’t work and VMware has built in safeguard to limit installation on unsupported chip sets. Another huge consideration is to evaluate your virtual machine roadmap. For example, your older hardware may be able to support ESX 3.5. If you were deploy based on that, then wanted to migrate to 4.0 or 4.1 you would be stuck buying new hardware and dealing with a migration. Which isn’t bad except for the fact you need to make sure your CPU will be compatible with VMotion. Also take into account there is a limit to the amount of compatible machines. 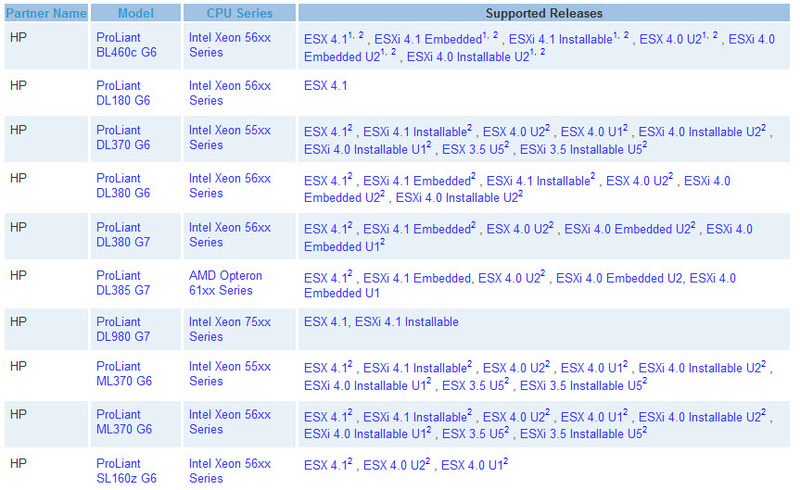 Below is a quick summary of the compatible HP systems for ESXi 4.1. As you can see the list isn’t too long. Granted this is just one vendor, it does show that there needs to be careful thought when planning out your hardware. Granted, I do recommend using older hardware when possible. A good example is test/dev environments or a lab type situation. That being said any thing to do with production machines I would think twice before re purposing older machines.